​WELCOME TO THE FRIENDS PAGE for the Babecamp Intensive in san francisco september 23-24! I am all about women living epic, magical lives on their terms in the body they're in right now. Other interests include: smashing patriarchy, eating fancy desserts, and helping to build a world where every single person - regardless of size or health status - lives a life free from discrimination and bigotry. There are no weight limits to my politics. This intensive is about supporting you so you can become the HBIC of your life. Together we will break up with diet culture - and the mindset that keeps us in restriction mode - so you can take up your rightful place in the babe pantheon. Ready to register? 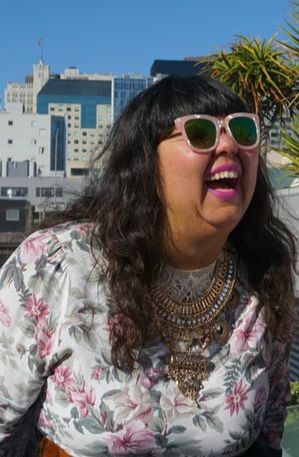 I'm a 250-pound unapologetic feminist who loves tiny shorts and bright lipstick. Fifteen years ago feminism saved my life. I stopped dieting and started living about six years ago when I met a bunch of rad queers who taught me about the power of loving my body. I completed a Master's degree based on my research on how body size and race affect gender. I've written extensively on body image and fat discrimination, and I travel globally speaking about these issues. When you sign up for the intensive, get ready to go deep into heart work. We will hit the ground running Day 1 with share-outs, assignments, writing, practice, and critical analysis. 2 full days of workshop from 10am-6:15pm with a 2-hour lunch break midday. The venue will be disclosed upon registration, but is located in San Francisco's Laurel Heights neighborhood. Registration does not include parking, meals, or accommodation. Registration closes on September 20 or until sold out. For many reasons, I'm unable to offer refunds. Babecamp is not a substitute for therapy. I'm not a mental health professional.